The images on this page are just a small representation of the huge range of tributes that can be made. It is not uncommon for people to become anxious about what type of funeral tribute they should select. In short, there are no real rights or wrongs. Very often the personal tastes of the deceased will play a large part in what is chosen, as well as the personal tastes of the person or persons selecting the tribute. Other times it may be a factor in the life of the deceased that is taken into account. 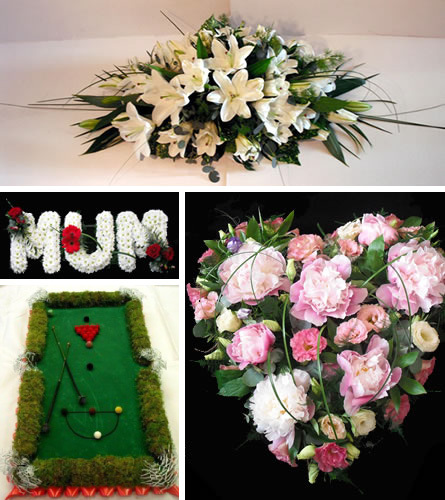 This can be a huge range of things and we have made tributes such as boats, tractors, flags, dolphins, books, foot-balls, football shirts to name just a few. Whatever your wishes, we are always on hand to advise and offer suggestions at this very difficult time. Please feel free to contact us for any assistance you may require.